Fearlessness might not run in the family. 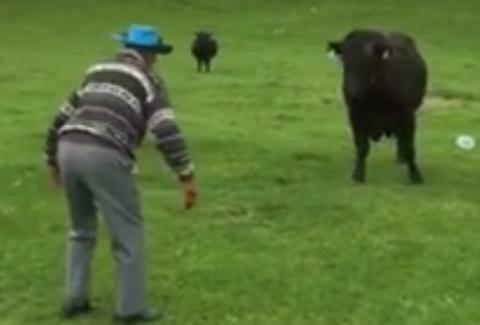 An 81-year-old man in New Zealand decided the best way to defend his truck from an attacking bull, determined to do battle with the SUV, was to get over the fence and scare the bull away. That man's son did not agree on his father's methodology. Whetu Konia, the son, posted a video to Facebook on Sunday of his father Mac walking right at the bull trying to do battle with their truck. Mac hurls a big bottle of water at the bull and walks after the bull with the stoic confidence of a horror film villain. Meanwhile, his son fearfully swears and repeatedly yells "Dad!" until it gets annoying. But he keeps yelling it long enough for it to become funny again in a demented sort of way. As the bull returns, Mac refuses to get in the car despite the pleas of his son. Instead, Mac waves his hat to scare off the bull. Even after he seems to have won the showdown, Mac isn't satisfied. He walks after the bull and tries to scare it again just for the hell of it. Konia later told One News Now that Mac grew up on a farm and would never back down in a situation like this. He also said the farmer who owned the bull told them that it was "just playing... having a laugh [at their] expense." Give the video a look above, though be warned there's some absolutely justified profanity in the video.